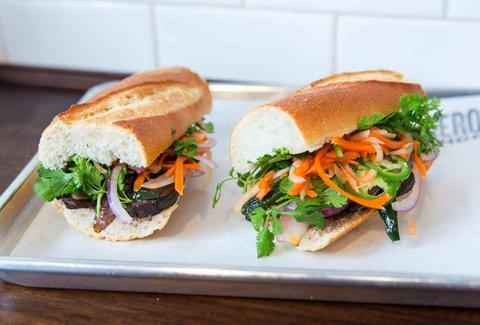 The Downtown sando outpost from the Black Hogg team has been steadily turning out solid banh mi-inspired ‘wiches, and since Halloween is lurking around the corner, they're dropping a new blood(y) sausage and peppers hero, with smoky Spanish morcilla sausage and rich house pâté, topped with sautéed pasilla peppers, pickled daikon, carrots, cilantro, and jalapeños, all cradled in a crunchy baguette. Downtown's gorgeous jewel of a restaurant 1) was just named one of the best in the US by Esquire, and 2) is now doing a prix-fixe, 30-minutes-or-less lunch, which means 3) burgers, rock shrimp rolls, and these beautiful creatures: fried chicken sandos with roasted tomato aioli and pickled onions. Proving that being a BBQ joint doesn't mean you can't also do awesome fried chicken sandwiches (because you totally can, guys! 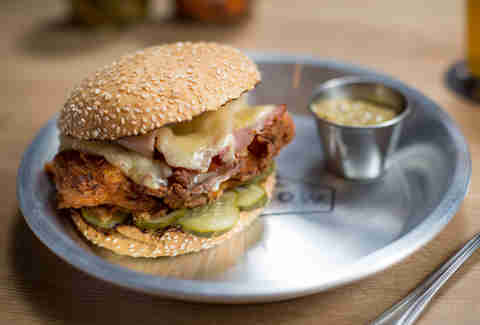 ), check out this new sandwich topped with a buttermilk-battered breast, Gruyere, and honey ale mustard on brioche. Yes. 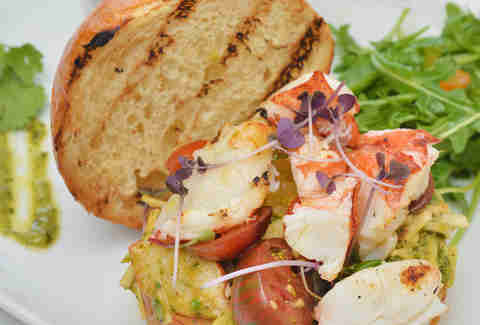 This schmancy-ish spot is doing a new schmancy-ish sandwich with grilled lobster tail tossed with a basil olive oil mayo, harissa, scallions, and crunchy apple and celery root, served up on a thyme-spiked brioche bun. Because, duh, brioche. 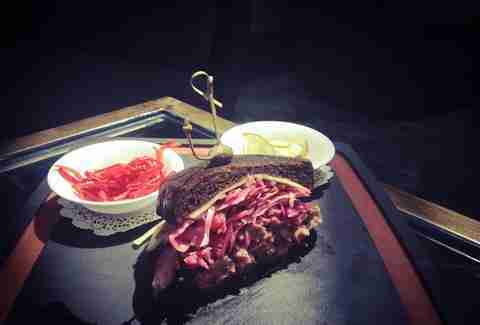 Remember that time when you were like "man, what could make this Reuben even tastier"? Well, Chef Luigi Fineo (no relation to Mario) totally heard you, and he’s like, "what if I sous vide this lamb for four hours with tons of Reuben-style spices and serve it up with pickled red cabbage, homemade Russian dressing, and Swiss on dark rye bread? Would that do it for you?". The answer is yes. Danny Jensen is currently stuffed between two pieces of bread himself. He's @dannyseamus on Twitter.